Further details from the Bloomberg article fill out the peculiar picture. Harvard was doing more than just hedging exposure; it was actively speculating in the derivatives market, “as early as 1994.” Its endowment fund took on many characteristics of a hedge fund: Its managers devised ways to do more than the usual effort to “fix borrowing costs for capital projects” by these derivatives contracts; they also “used swaps to profit from interest-rate changes.” Larry Summers, Harvard President from 2001 to 2006 (when he was driven out of the place by p. c. enforcers), came to the school after serving as U.S. Treasury Secretary during the end of the tech bubble, the bursting of which bubble shifted the focus of investment in America from technology firms and IPOs to real estate and structured finance. He had earned his Ph.D. at Harvard, and was made a tenured professor at the tender age of 28. In the summer of 2005, Summers pushed for a big real estate investment by the university. He “unveiled his vision for a campus expansion replete with new laboratories, dormitories and classrooms, renovated bridges and a pedestrian tunnel beneath the water.” To fund all this he called on the endowment, now a decade into its operations in speculative trading. “Harvard was flush at the time”; the endowment was worth $22.6 billion and “had returned an average of 16 percent during the previous 10 fiscal years.” Not too shabby. Might the exuberance of Harvard Square have resembled the morbid optimism of the Financial Products unit of A.I.G. in London? University endowment funds have been active in the derivatives markets for many years. Bloomberg notes a handful of other financing projects at other Ivy League schools that employed swaps and other devices. Many of these, too, produced big losses, though none on the scale of Harvard’s. In another eerie parallel to A.I.G., where former CEO Maurice “Hank” Greenberg was driven out by political pressure after massively expanding that firm into the field of finance wizardry, Harvard’s finance whiz Summers was run out of town for venial political reasons. He spoke vaguely of differences in cognitive abilities between men and women, and the feminists pounced. When the financial world fell to pieces in September 2008, both A.I.G. and Harvard would face crisis and calamity due to their exposure to derivatives. A.I.G. became the very emblem of catastrophe and bailout for this Great Recession; its gargantuan rescue by the U.S. Treasury and Federal Reserve would have to be (rather embarrassingly) reworked multiple times; its officers would be dragged before Congress for rhetorical bludgeoning; and its notorious London unit traders would in time figure as symbols for the reckless risks of the financier class. Only now, a full year later, has A.I.G. started to recover, though only as a shadow of its former self. Harvard, meanwhile, would have to receive special authority from a Massachusetts state agency in order to raise the funds to fill the hole in its capital base. The bonds sold to raise this cash were sold at the very nadir of the market. Bloomberg quotes an analyst who does not mince words: “December 2008 was, by an enormous amount, the worst time in history” to have to float bonds to terminate the swaps. A year out from this mess, Harvard has reduced its development and finance planning dramatically. The financiers of Harvard Square have pulled in their horns. Bloomberg again: “Cranes were recently removed from the construction site of a $1 billion science center that was to be the expansion’s centerpiece, a reminder of Summers’s ambition.” Work on the expansion project is suspended. Here then is another instance of what I have called the great usury crisis, the breakdown of this speculative trade in securities and derivatives, all interlocking to form a vast infrastructure of debt finance. The basic fragility of this system, which spread over the past thirty years from America to almost every corner of the developed world — and many dark and seemingly obscure corners of the developing world — is now evident to everyone with eyes to see. The integration of world capital markets by means of mathematical abstraction, probabilistic modeling, and huge leverage ratios, has midwived an astounding transformation in the political economy of the Republic, decisively away from Free Enterprise and towards a bizarre sort of technocratic Socialism. --or in modern terms, "We must march on Washington under the slogan, 'Next time with guns!'" I never have anything very profound to say about these financial posts, except to (in a sense) beat my own small drums. In this case, the reference to debt financing seems to me yet more evidence that it would be a great boon to our country if people could feel the responsibility of their debts, could feel ashamed if they could not fulfill them, and could therefore be *generally very reluctant to take on debt*. I realize that Zippy, whom I admire greatly, has a very different take here and does not feel that a general stigma against debt is a particularly good thing. All I can say is that it seems like a lot of things were healthier when a man felt his honor to be at stake in paying a debt and when people were extremely cautious at taking on debts and did not regard them as, in a sense, mere contractual bets, nor take defaulting lightly: "I bet that I'll be able to pay this off, but if I can't, hey, we have the provisions for default written in there somewhere, and we'll just move to those as Plan B. No biggie." "It would be a great boon to our country if people could feel the responsibility of their debts." I think most of us can agree with that. But we're really not talking so much about people as individuals or even families; we're talking about business corporations. To a business enterprise this concept of honor is deeply attenuated. Its purpose is to succeed, profit and grow. Its operators have their authority to the extent that they are pushing toward maximizing shareholder returns. There are situations where defaulting on a certain class of debt is simply a rational decision. A CEO doesn't get paid so that he can say, "sure, we took a hit on profits, dividends and market-share but I maintained the corporation's honor." It's been a long time since J. P. Morgan could get all the financiers and tycoons on his yacht; and amidst fine scotch and big cigars hammer out a deal to avoid all the competitive unpleasantries. You'll note that even Harvard took steps to free its investment fund from the strictures of academic stuffiness. Summers wanted that fund to be active in new and innovative markets, like any other player in the wild field of securities speculation. Now, I do agree that it would be worth looking into ideas about how to press the investment banks back into private partnerships. That might be an effective step toward a restoration of the honor system. A similar related step would be an updated version of the New Deal regime that segregated retail banking from investment banking, so that your insured deposits do not (theoretically) get caught up in the debt-securities trade. But of course, these two reforms would constitution a repudiation of sorts, of the recent era of deregulation and capital-market integration. Partnerships and an updated Glass Steagall are a good idea but a presumption that income over a certain amount that isn't based on long term capital gains can only be the result of fraud or rent seeking would also be useful. Paul, I know I may be way off on this, but...Suppose that all the little, ordinary guys were like me (or still more, my husband) when it comes to debt. As in, I _hate_ it. I avoid it as much as possible. I have none right now. Would never in a million years have agreed to a variable-interest loan. Wouldn't that have a big impact on all the high-flown financiers? Wouldn't it make it hard at some level for them to get what they want to do off the ground? Certainly in the mortgage crisis, we had a lot of people, ordinary people, not just big financiers, who took on home debt really unwisely, and that contributed to the problem. It also contributed to the problem that they could _get_ those loans. Consumer behavior is already having an impact. The dramatic shift from a savings rate of near-zero, which prevailed in the last half-decade, to 4% or whatever it is now, is evidence of this. So is the shift toward renting rather than owning. We would have to see a much more decisive consumer debt-strike, however, to make a real difference in the financial industries. I mean, if someone could convince the small investors in the mutual fund market to shift their assets into equity and other non-debt investments, that would make a difference. But people invest is bonds for reasons. They want a better position in a company's capital structure, or they want the steady revenue of coupon payments, or they want security against the wipe-out of equity that bankruptcy generally results in, or maybe they want the higher yield of more risky bonds. In a word, bond markets are massive. Debt-finance is the very heart of globalization. Its expansion over the past generation has been the fuel for the growth we've enjoyed. Its purpose is to succeed, profit and grow. Its operators have their authority to the extent that they are pushing toward maximizing shareholder returns. Aye, there's the rub. Talk about non-equilibrium economics, or delusional economics, whichever you prefer. What does maximizing anything in an open system mean? I am even more primitive in my economics than Lydia. I pay for everything in cash. I understand negative and positive numbers, but I don't understand how shareholders can be entitled to unlimited or even unending returns. This is open system thinking and just as in the case of credit cards, can lead to some very unexpected results. Credit cards are a form of inverse stock market, where you don't invest in a company, they invest in you and expect a return on that investment every month. Much to admire in defence of virtue as the operating principle in man's affairs, but wheretofore then Paul Cella would one have need of "insured" deposits? Assuming it is dishonorable to embezzle (i.e. expropriate with no intention to repropriate) then the customary laws against theft would surely apply? Restitution in cases of bankruptcy is only ever necessary when expropriation has been privileged and the authority legitimizing such moral hazard attempts to amelioriate the inevitable hardship cases that arise, as welfare payments ameliorate the social insecurities arising from privileged sexual license (covering the costs of lifetime sustenance of extra marital children). 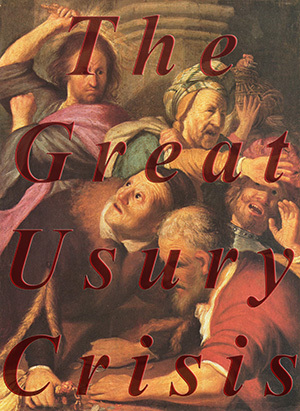 The fallacy in so many of these "great usury" posts is that the fault lies in the way money is used, an incorrect idea, but in the way the production of money is privileged by public authorites to the detriment of the vast majority of partakers of the public good (as in partakers of marriage as a public good are harmed by the license of those who usurp that privilege eliciting insecurity as a consequence). "In the late eleventh century, Ivo of Chartres had already briefly distinguished a societas from a usurious loan, and the distinction was elaborated in the early thirteenth century by the theologian Robert of Courçon (c. 1204), and in John Teutonicus" Gloss on Gratian (1215). Courçon had made it clear that even an inactive partner risked his capital in an enterprise. " The great moral hazard our age faces is that the public authorities have legislated for "institutional usury." Medieval-era theologian philosophers (heck, why harken back so far, early Victorian-era theologian-philosophers, such as Rosmini, assumed that Truth was timeless) would be aghast at how long-term property rights are being put at risk for short-term gains. Imprudent conduct is a practically a foregone conclusion from unfettered fiscal policy of modern democracies with central banks. The time preferences of a monarch was to preserve his patrimony (his estates immovable held free from liens and all other holdings movable entrusted to the custody of the most REPUTABLE banking institution of the region) and order his procurator fiscal to scrimp and save until the cost of payment of necessary goods and services to be rendered could be advanced in terms agreed to under contract (even a Victorian Englishman, whose home was his castle, would never contemplate gettings into arrears for fear of loss of social standing and evaporation of an already insecure income stream). The great "crisis" is actually one between illusion and reality in basic economics, where FED-induced credit bubbles have fueled and fooled many into a false sense of wealth. all-the-while the instruments of the productive economy were being disadvantaged and dismantled to be "outsourced" elsewhere. Until we reconcile this fundamental truth of the public harm willingly subscribed to by those of us raised to put our faith in "investing" under "social contracts" (the unfunded liabilities for social security have now made that vaunted "national institution" insolvent as of 2009) popularised in the last 50 years, we will not be in a position to prevent the irrevocable destruction of what remains of the social compact called "democracy."